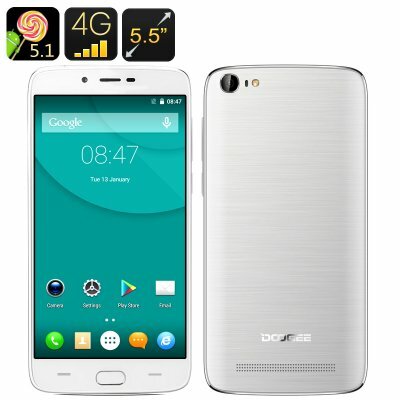 Successfully Added Doogee Y200 Smartphone - Android 5.1, 4G, 5.5 Inch Screen, 2GB RAM, Fingerprint Scanner, Smart Wake, Gesture Sensing (White) to your Shopping Cart. A masterful Phablet packed full of extras the Doogee Y200 makes your large screen phone experience a joy with seamless processing and intuitive navigation functions. Running on a quad core CPU and 2GB of RAM the Doogee Y200 brings a smooth seamless performance that is more than capable of playing movies without any lag. there is a Mali T720 GPU for heightened gaming abilities and thanks to this phablet's 5.5 inch IPS HD screen you will have the perfect display for all your content. A fingerprint scanner is integrated into the home button of the Doogee Y200 for the latest in Smartphone security and total peace of mind. This makes it easy to restrict access, so only you or those you trust can access the precious content of your Smartphone. An impress 32GB of storage space is double what you would normally expect on a mid range phone but should you demand more there's a micro SD card slot for attending a further 32GB of storage. This feature packs Smartphone offers up more than its competitors with greater functionality and easy navigation. Take advantage of Smart wake and gesture sensing when opening and using apps. With Hot Knot you have fast data transfer that's quick and easy to use and the Doogee Y200 lets you enjoy great compatibility with OTG support. The Doogee Y200 can take one SIM and a micro SD card or Two SIM cards, this is a great bonus for managing both business and personal contacts or can save you a fortune on call charges when used to avoid roaming costs on holidays or trips abroad.. There is a rear facing 8MP Sony camera that when used with interpolation can bring 16MP imagery. A perfect solution to having to carry a camera on your next holiday or trip and a great way to capture those memorable moments in life. With its 3000mAh battery the Doogee Y200 brings plenty of power for daily usage as you can enjoy up to 10 hours of talk time or around 72 hours in standby from each full charge. The Doogee Y200 Android phone comes with a 12 months warranty, brought to you by the leader in electronic devices as well as wholesale Android smartphones..